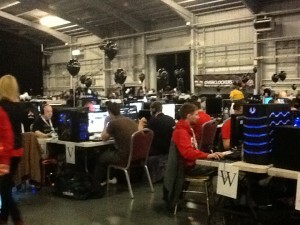 Yesterday fellow UKGE organizer Pat Campbell and I went along to a computer gaming convention called – appropriately – Insomnia which was held at the Telford International centre. This was by invitation of the Insomnia organizers who were looking to expand their tabletop gaming area and having attending UK Games Expo in May asked us along. In a third main hall there were fifty or so companies all with their own games or equipment on offer and you could slide into a chair and try out their game. I was drawn to the new game World of Planes that I fancy having a go on sometime. 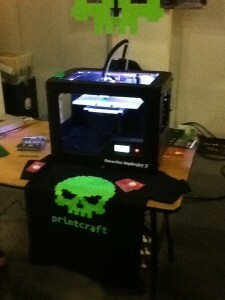 Another interesting item I spotted was a 3D printer which was printing out 3D games characters. I am sure that 3D printing could be used in the tabletop gaming world to make board game or miniature gaming pieces and I made a note of the company to look into that further. The ‘You-Tubers’ These are the guys who make videos of computer game play with commentary, often quite funny, and upload it to You tube. My 10 year old watches hours of these guys videos. They had a couple of dozen stars of You Tube at the convention. the queue to meet the gamers favorites stretched across the top floor! The game designers who gave talks in well attended panels. 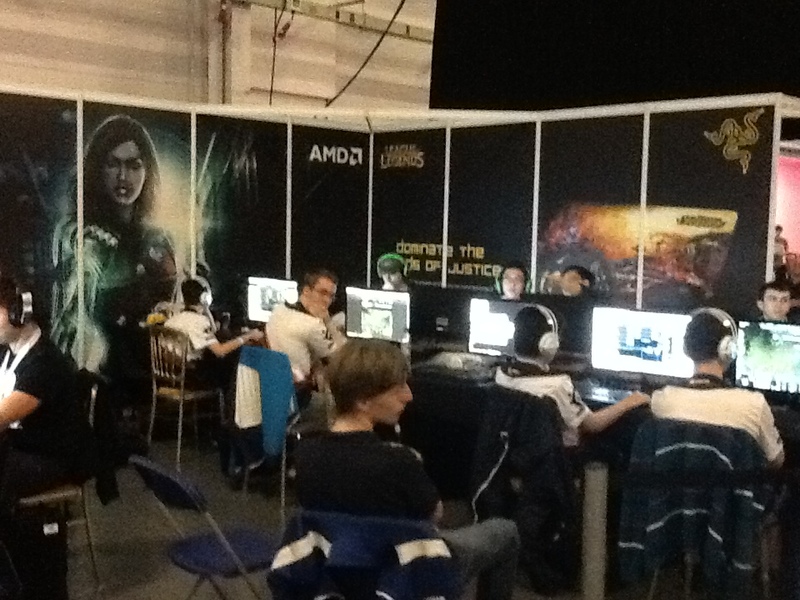 The gamer superstars who were fighting it out for top prizes worth thousands of pounds. 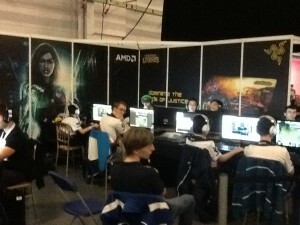 The main hall had seatingfor something like 2000 and was jammed with gamers watching OTHER gamers play finals of tournaments which were shown on huge plasma screens. As for the purpose of our visit we went and looked at the area that Esdevium were running this year. They had a dozen tables with good choice gateway games like Settlers of Catan, Ticket to Ride and a giant version of Pandemic. 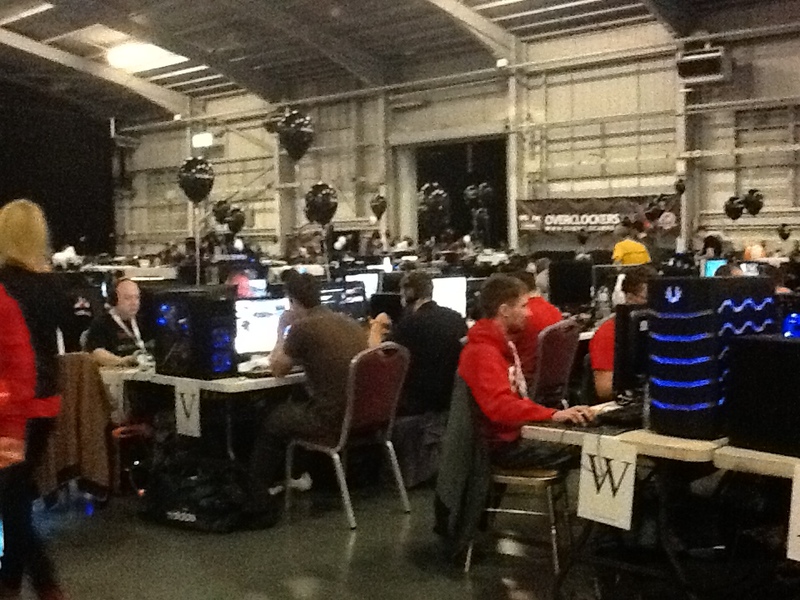 I was concerned that the electronic gamers would turn their noses up at the area but in fact the gaming area was quite busy and the giant games in particular well attended. As there is an Insominia at Easter next year – in the run up to Expo – I am hopeful we can attend and work with the organisers and Esdevium to create a bigger area with other giant versions of the games as well as maybe some Roleplaying and Miniatures. I can see visual displays like dwarven Forge going down well. I do play computer games occasionally like most tabletop gamers so it was an interesting visit. 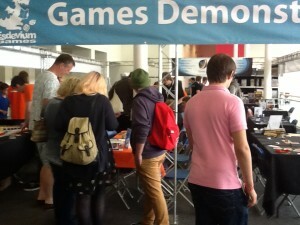 What struck me most though is that the audience at Insominia were quite similar to UK Games Expo audience and that it was clear that once shown a good table top game that there WAS interest from the folk whose main love is electronic gaming – and in particular their families who brought them along. I strongly believe that if shown a GOOD tabletop game that there can be a large overlap between those who pay the main stream computer games and the growing and reviving tabletop hobby which I hope UKGE is at the heart of.